The jam kettle is an all-purpose machine for producing high-quality products such as jam, marmelade and jellies. Furthermore the kettle can also be used for dissolving sugar, cooking tea, etc. Thanks to the compact stainless steel construction and the integrated mixer, various stirring- and mixing processes can be carried out. The water-bath kettle is heated by 2 electric heating cartridges. An insulated casing prevents any heat from escaping. After filling the water jacket with water, the kettle is ready to operate. 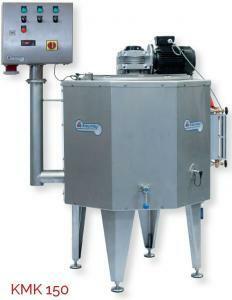 The electric heater heats the water bath to the set temperature and keeps it constant. With the integrated mixer, the product is evenly heated and mixed. After the cooking process, the kettle can be easily emptied with the disc valve on the bottom.